When it comes to monitoring heart health, Heart Rate (HR) and Heart Rate Variability (HRV) are critical metrics that reflect a person’s overall fitness and well-being. By driving the creation of wearables with significant processing capability and complementary online tracking services, today’s powerful biosensors provide insights into HR and HRV—giving device manufacturers opportunities to create groundbreaking new products, and providing consumers with new ways to understand their personal health and wellness better than ever before. This post provides an introduction to HR and specifically, HRV, detailing what this metric is capable of analyzing and exploring how ECG biosensors can be used to capture, process and analyze these complex bio-signals. What is Heart Rate (HR) & Heart Rate Variability (HRV)? HR is a static measurement of beats-per-minute that varies by activity level. The baseline HR is the rate measured when a person is in a resting position. While having some merits, a resting heart rate itself is not considered a leading overall indicator of heart health. HRV is a measure of beat-to-beat variation over a period of time—in other words, the heart’s ability to accelerate and decelerate quickly and efficiently to meet the body’s immediate needs. While individual HRV readings can vary based on a number of factors, a higher average HRV over time is generally seen as “more fit” than a lower average. It’s also been widely demonstrated that routine aerobic exercise improves HRV over time. Useful applications for HRV continue to emerge, enabling users to obtain a detailed understanding of their health and wellness—from general consumers and athletes to caregivers seeking an expanded view of their patient’s overall health. ECG (electrocardiography) biosensors measure the biopotential generated by electrical signals that control the expansion and contraction of heart chambers. In the case of today’s ECG-based wearables, measurements can be taken via electrical biosensors in devices often worn on the wrist. ECG biosensors are capable of measuring both Heart Rate (HR) and Heart Rate Variability (HRV, delivering the widest range of health metrics because they capture more comprehensive signals of overall heart performance. 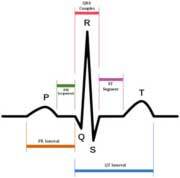 The “R Peak” shown above in ECG waveform is used to mark the heartbeat. Because of its steep incline, algorithms that precisely extract the interval between successive R Peaks can be created. This is essential for calculating HRV accurately with shorter duration samples. Until recently, ECG biosensors like the NeuroSky BMD101 were available only in high-end medical equipment. They are now practical for use in consumer wearable and mobile device applications, offering HR and HRV insight more affordably than ever before. 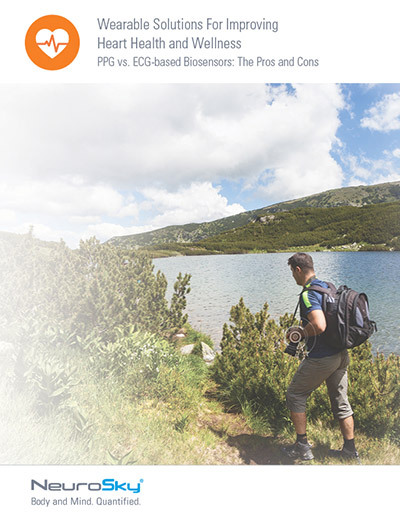 To learn more about the advantages of ECG biosensors and their ability to capture and process HRV data, download the free whitepaper, Wearable Solutions for Improving Heart Health and Wellness.